If you would like to know more about small scale organic pork production, this is the book for you! 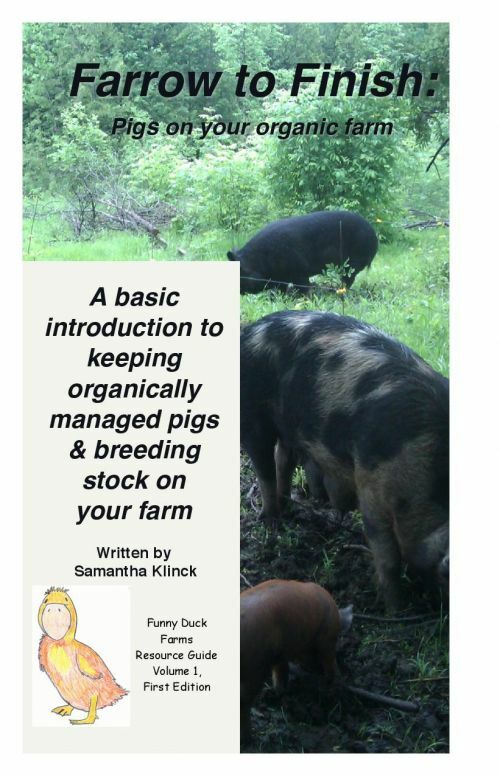 This is a basic handbook that is well suited to those with hobby farms and small organic farms who would like to raise pigs year round. It is also a great guide for those that wish to learn more about keeping their own pigs for breeding stock. Preventative pig care, and more! Learn how you can best integrate organically managed pigs into your specific farm environment, even on a shoestring budget. Use the paypal button to pay for your copy today. Select below if you are purchasing at the farm gate, in Ottawa, or if you require shipping in Canada or to the USA, then fill out the form below with your shipping address. For shipping outside Canada, please contact us at info@funnyduckfarms.com with your delivery address.